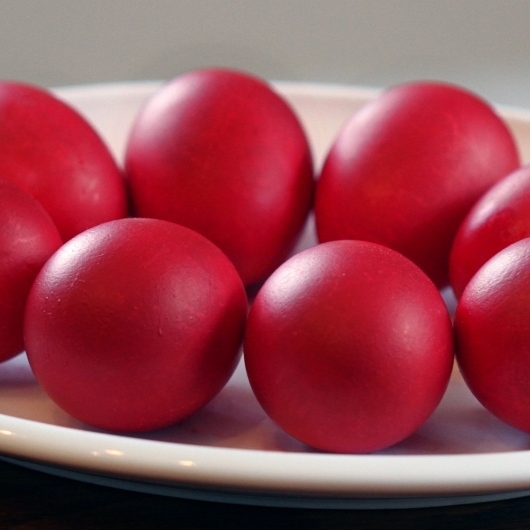 Symbols of Easter and life itself, red eggs are one of the main attributes of the Easter table. They are dyed on Good Friday, the color representing the blood and sacrifice of Christ for humanity. As it is known, when Saint Mary Magdalene told the Roman Emperor Tiberius of Christ’s resurrection and gifted him with an egg, he replied “I’d sooner believe in this egg turning red than a man coming back from the dead.” The egg immediately turned red. Thus, dyeing eggs became an ongoing tradition among Christians ever since. 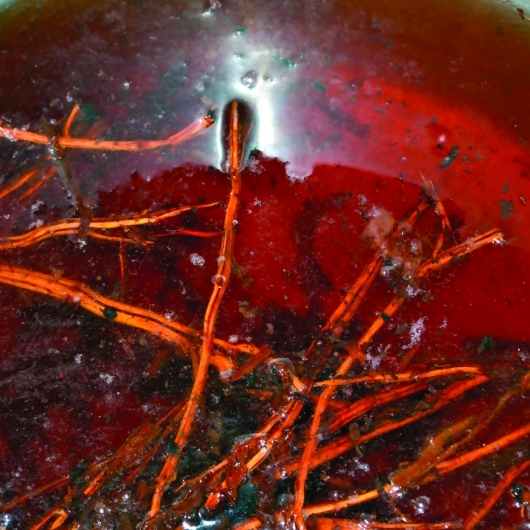 Here we present the traditional method of dyeing eggs red by using rubia (a herb colloquially known as madder). Remember, traditionally the eggs should be dyed before sunset. Those to whom madder is not available can use onion peels instead. Carefully wash madder and chop it up. 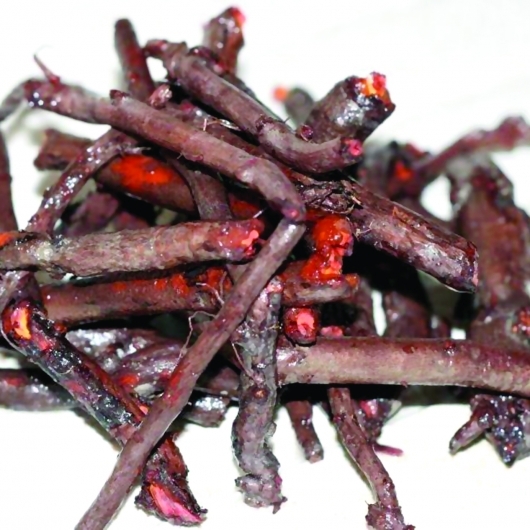 Put chopped madder in a saucepan and cover with 1.5 liters of water. Add onion peels and salt. Put the saucepan on the stove for 20 minutes and let the water boil. 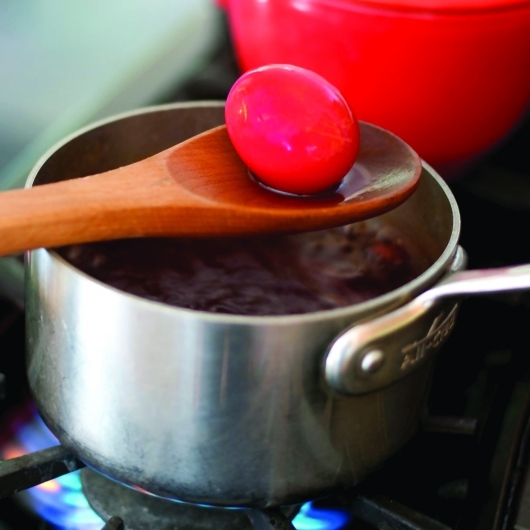 When the water cools down slightly, place eggs in the saucepan. Do not put too many eggs together, as they will not dye well that way. Let the eggs boil for 20-25 minutes. If the water does not cover the eggs entirely, pour in some more. 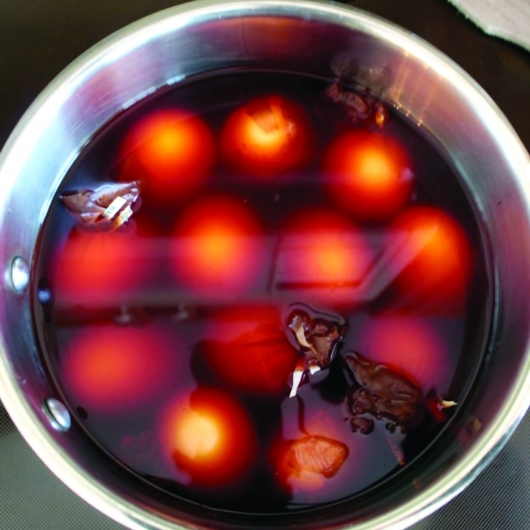 After 25 minutes passes, place the eggs in cold water and leave for 10 minutes. When the eggs cool down, you can apply a small amount of oil to them using a piece of cotton to make them shiny. Put the eggs around green wheat spouts or Easter bread (paska) and serve.